A mere pounamu at Otago Museum carries the stories of its people, writes Rachel Wesley. Mere pounamu are probably one of the more iconic taoka of the Maori world. They are designed as a close-quarter weapon and there are a number of grisly descriptions in 19th century ethnographic accounts of how they were used with great effect to dispatch an enemy combatant. Mere pounamu are associated with rakatirataka and mana: chiefly attributes and status. Many mere pounamu were named and feature prominently in iwi histories, some so well known and revered that they assumed supernatural powers in the retelling of their exploits. Mere pounamu were handed down from generation to generation, accruing increased mana with each successive owner. 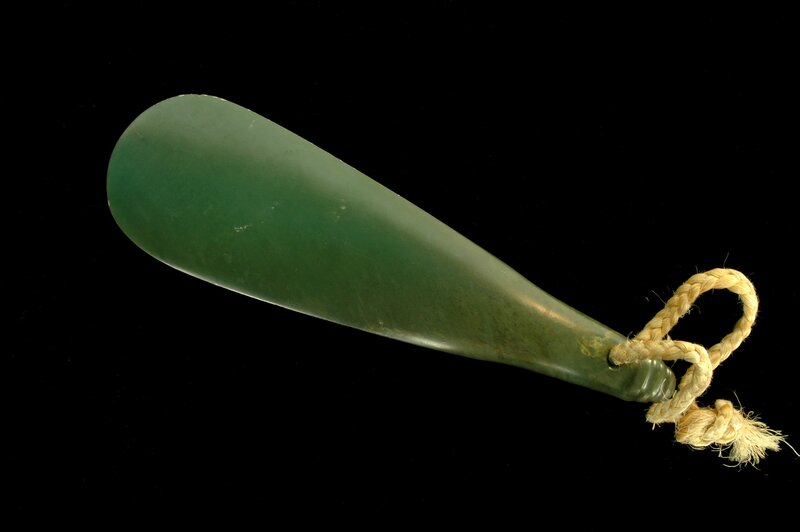 This particular mere pounamu, Kahutai, belonged to the well-known 19th-century rakatira (chief) Karetai. Karetai, based at Otakou, was a southern chief who possessed all the traditional traits of a rakatira: the right whakapapa, a proven battle record, and solid political nous. Born towards the end of the 18th century, Karetai was one of the principal commanders, along with another great southern rakatira, Tuhawaiki, of the war party known as Taua-iti, which defended Ngai Tahu's northern boundaries against Te Rauparaha and Ngati Toa in the early 1830s. During a battle with Ngati Toa at Kapara-te-hau (Lake Grassmere), Karetai was wounded to the extent that he lost an eye and had a permanent limp ever afterwards. However, this only served to increase his mana among his people. Karetai was a leader who bridged worlds: he was born into a world where Europeans were just starting to venture at the end of the 18th century, and died in 1860 after helping guide his people through a very rapid and tumultuous transition into a new world order. Karetai was at the front of a number of major milestones, not just for his iwi, but for the burgeoning colony of New Zealand. The first of these was the signing of the Treaty of Waitangi on June 13, 1840 at Otakou. In addition, he was also one of the principal signatories to most of the major land sales in the South, including the Otakou purchase of July 13, 1844. With this particular purchase, Karetai originally argued that the whole of the Otago Peninsula should be reserved from the sale. However, he eventually agreed to a portion that encompassed Mt Charles to Otago Heads. Just a couple of years before his death, Karetai was one of the signatories of Matiaha Tiramorehu's 1857 petition to Queen Victoria, asking for the Crown to address its failure to honour the terms of its land purchases from Ngai Tahu, in particular, the setting aside of sufficient reserves for the iwi to live on. Kahutai was passed from Karetai to his son Timoti. After Timoti's accidental death in 1893, it went to his daughter Alice, and then her niece, the late Magda Wallscott, great-granddaughter to Karetai. Magda loaned Kahutai to Otago Museum during the 1970s, where whanau kaitiaki continue to guide its care. Thanks to Kahutai's current kaitiaki for permission to feature the mere pounamu. Rachel Wesley is curator Maori at Otago Museum.